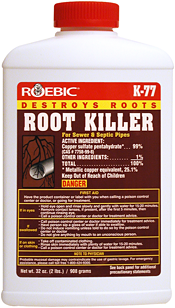 K-77 Root Killer destroys clogging tree and shrub roots from pipes fast. When roots invade sewer pipes and clog septic system drain fields, Roebic's fast acting root killing formulas are needed. K-77 Root Killer clears roots from leach fields, improving drainage and flow. 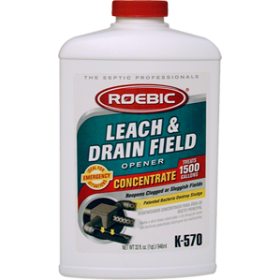 This can prevent standing water and soggy conditions from developing over a leach field. Not available in Connecticut and the Bay Counties of California. 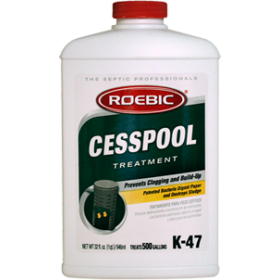 Banned for use in septic systems in Florida and Massachusetts. Root problems can be very annoying and expensive to fix. Fortunately, root problems can be controlled through the use of either Roebic K-77 Root Killer or Roebic Foaming Root Killer (FRK). You will need to choose the one that is right for your particular situation. Both of these products kill invading roots, but they will not "burn or "corrode" the roots out of the system. After the root is killed, it will begin to degrade via microbial action in this bacterial rich environment. It is this action of root degradation which will "clear" your system. K-77 Root Killer can be used as needed to kill troublesome roots, thereby restoring proper working order to the system. This product works without harming surrounding trees, ground cover, or the natural bacterial content of the septic tank or cesspool. 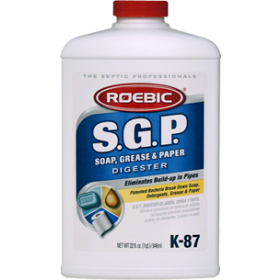 However, if your system has no flow at all, then you should first have the system mechanically cleaned out before treating with K-77 Root Killer. The reason for this is if K-77 Root Killer cannot get to the roots, it cannot kill them. K-77 Root Killer should clear your system of roots in anywhere from 2 days to 2 weeks. The time it takes depends on the severity of your root problem, and where in the system the root problem is occurring. If you do need to have the system rooted out, wait 3 to 4 weeks after this is done before applying the K-77 Root Killer. Some of you may need to use Foaming Root Killer. 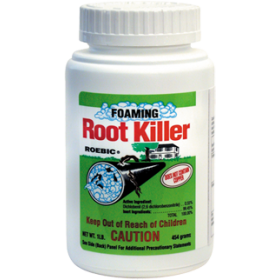 If you have a septic tank and the root infiltration is either in the main waste line (the line that brings sewage to your septic tank) or in the tank itself, then you should use Foaming Root Killer to kill those invading roots. See the discussion below entitled "In Sewer Lines". In Sewer Lines - Do you have roots that are clogging a sewer line? If the answer is yes, then you may have a potentially costly problem. Pour 1/3 of bottle into toilet bowl and flush. Immediately repeat this step until all of the product has been flushed into the sewer pipe. For low-flo toliets, additional flushings may be required to completely remove Roebic K-77 Root killer crystals from the toilet bowl to the sewer pipe. You may also add contents directly to the septic tank drainfield through the distribution box. Add 2 to 3 gallons of water to carry crystals to root growth in pipes. Do not apply this product in a way that will contact adults, children, or pets, either directly or through drift. Q: What is the difference between K-77 Root Killer and Foaming Root Killer? A: K-77 is not a foaming root killer; it is still a contact root killer but does not have a foaming action. K-77 will treat an entire septic system from the house to the drain field. Foaming Root Killer will only treat from the house to the septic tank. 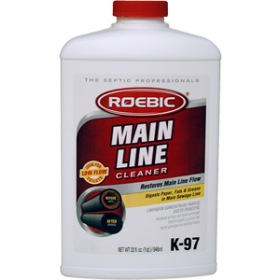 If you are treating a sewer line the K-77 will treat a longer length of pipe line and one bottle of Foaming Root Killer only treats up to 50 feet of 4" pipe line. Q: How many times per year should I treat with K-77 Root Killer? A: Root killers should be applied twice per calendar year. We recommend treating the pipe in the spring and in the late fall. Q: Can I apply K-77 Root Killer directly to the roots? A: No, K-77 is a registered product and has specific application instructions that need to be followed. K-77 should be applied directly through the toilet as specified on the label. 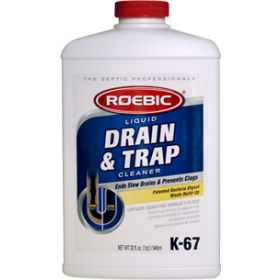 Q: Can I apply the K-77 Root Killer directly to the Septic Tank? A: You can apply the K-77 Root Killer through the distribution box. Pour three gallons of water after pouring the product in to carry the crystals through the pipes. 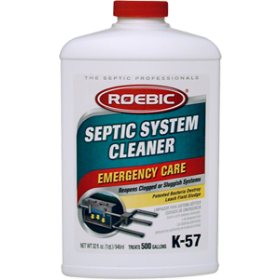 Q: Will K-77 Root Killer harm the bacteria that are already in my septic tank? A: The bottle of K-77 is a 2 pound bottle that should not be destructive to the bacterial growth in the tank. However, we do recommend treating the system with a bottle of K-37 Septic Tank Treatment about two weeks after using a root killer in case any weaker bacteria were destroyed. Q: Can I pour the K-37 Septic Tank Treatment and K-77 Root Killer in the tank together? 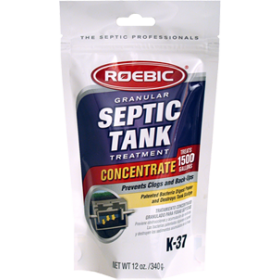 A: No, you do not want to add the Root Killer and The Roebic K-37 Septic Tank Treatment in at the same time. They should be applied a few weeks apart. Start with the K-77 and then in three to four weeks you can apply the K-37. great stuff, have used before, no root problems since starting. 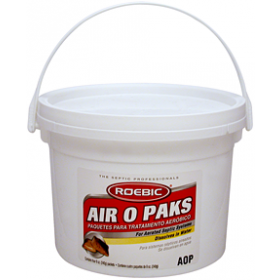 I've used this product for years and it has done a great job of keeping roots out of my sewer line.